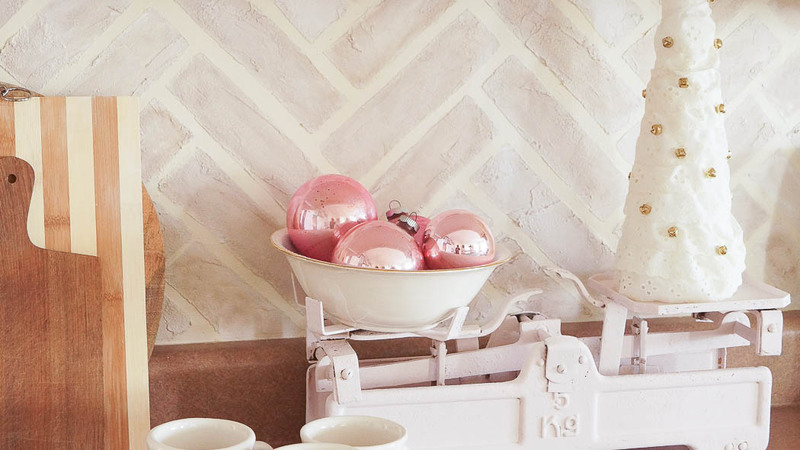 I’ve been sharing sneak peeks of my kitchen decked out for Christmas, and today is the reveal. I will be sharing a full home tour in a few days. 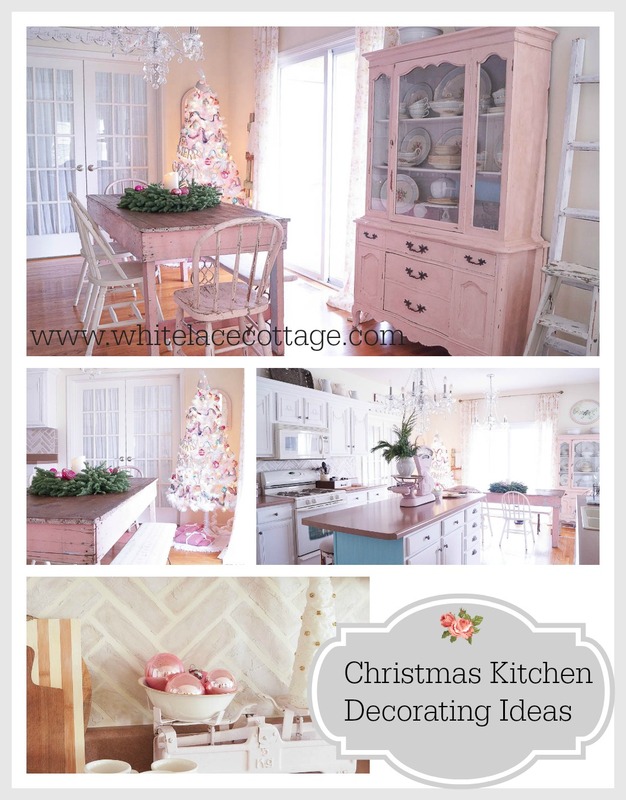 I want to share simple Christmas kitchen decorating ideas. 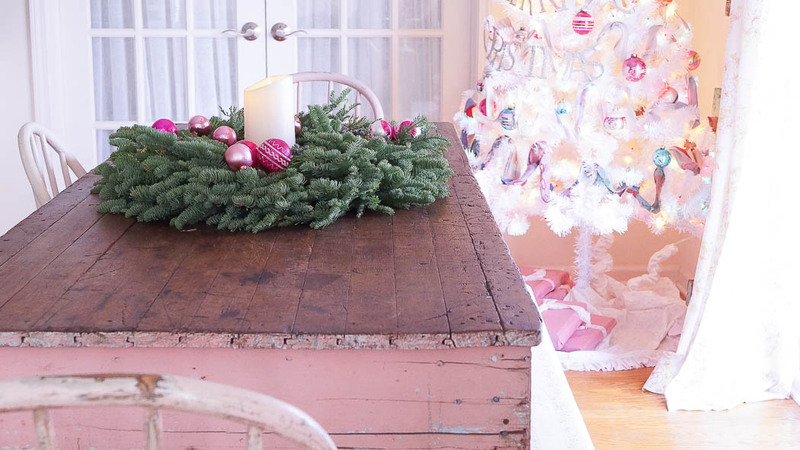 Decorating for the holidays doesn’t have to be complicated or expensive. I’m blessed to have a large kitchen, so once again I’ve added a tree to the corner of the room. For the past few years I’ve done something a little different for a my kitchen tree skirt, but this year, I couldn’t find what I was looking for. And what was I looking for? Honestly I have no idea, but I wanted to do something different, but I just couldn’t come up with anything. I did add this tree to a small table, but it looked out of balance. So, crazy silly me, all by myself, I carefully lifted this tree off of the table and placed it on the floor. Without breaking any ornaments, pretty good huh? The tree looks much better on the floor, it’s much more balanced! 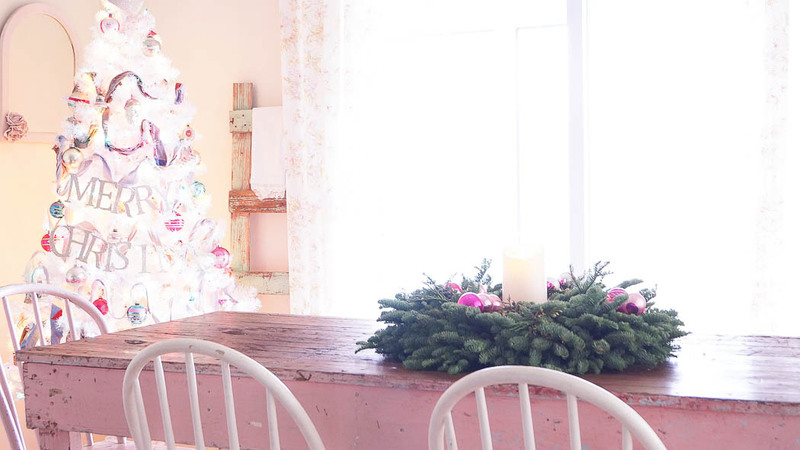 If you want to add a tree to your kitchen, but your kitchen is small why not add a mini tree on your kitchen table, as a centerpiece. They sell fresh tree tops in several sizes, that would be a great size for a small space. I’ve kept things very simple and I absolutely love it! This wreath that I am using for a centerpiece is from Lynch Creek Farm. I love my new table , it really was meant to be in this kitchen. On my kitchen island I’ve added fresh greens to a white ironstone pitcher. But you could use faux greens in a pitcher, or spray painted twigs from your yard. Let me tell you I enjoy looking at my photos as much as you do. My kitchen does not look like this on a daily basis. And what you are not seeing in the photo is my messy desk, which is not in the photos. Oh I wish I could keep it this neat and tidy everyday. But, it’s called reality and no one lives like this, not even me. See, I should have updated my chalkboard wall, I totally forgot about that. Well, that’s next on the to do list. But you can see, it’s very simple. Here’s a side shot of my new table, that bench was in my bedroom, but I decided that it works better in here. I added a different bench to my bedroom. Here’s a closer look at the fabric. 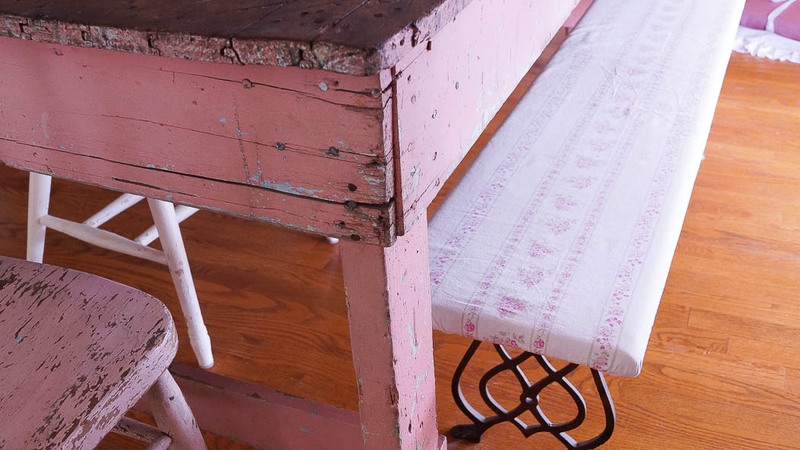 It’s a shabby chic shower curtain, that I cut and stapled to this bench. I think this old table top was flooring at one time, see the side. The top is perfectly imperfect! The tree skirt was a no sew that I shared last Christmas, you can view that HERE. And those packages, are just empty boxes wrapped. But I think it looks pretty to have a few wrapped packages under the tree. So far our cat has not destroyed any of it! 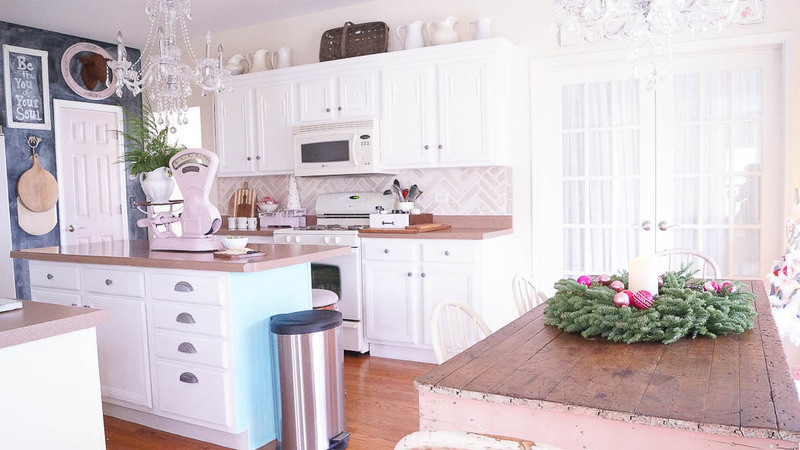 Take a good look at my kitchen, you will see that I’ve decorated it for the holidays but it’s very simple. I’ve only added a decorated tree, a wreath on the table. A small vignette on the counter. And fresh greens in my ironstone pitcher on the counter. Many of us get so stressed this time of the year, trying to make everything perfect. Enjoy the season and just keep it simple. 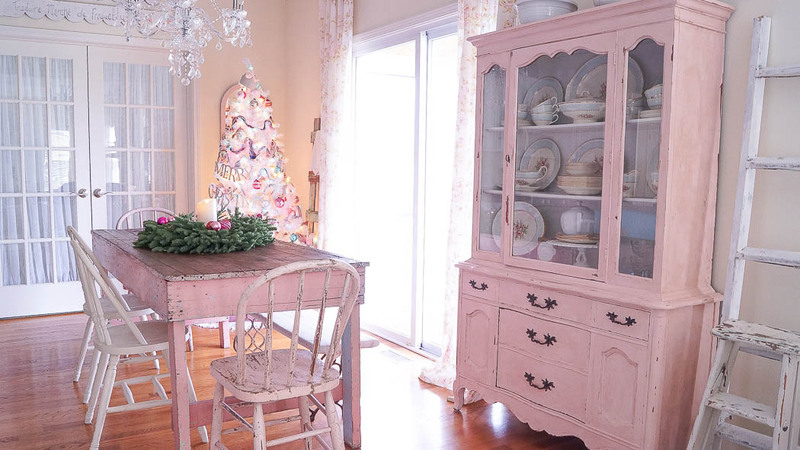 Anne, your Christmas kitchen in pink is so sweet! Yes, sweet. 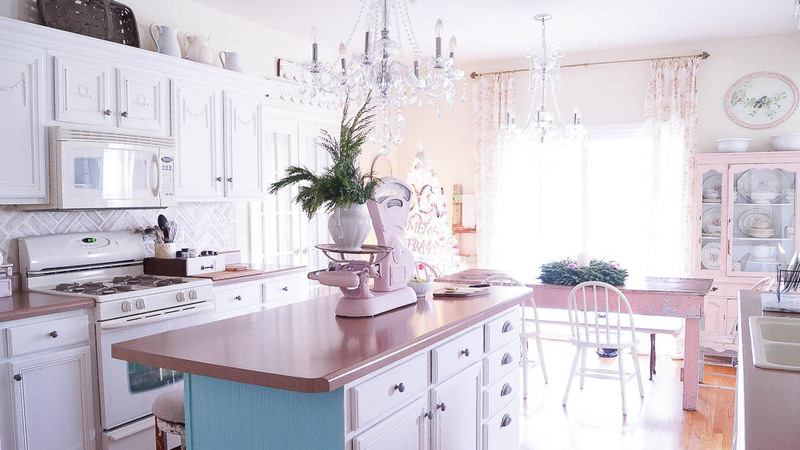 Christmas decorating in your kitchen is just right, and i do love your kitchen. As I’ve said before I love the pink in your kitchen. And yes, the tree looks better on the floor. Merry Christmas to you! 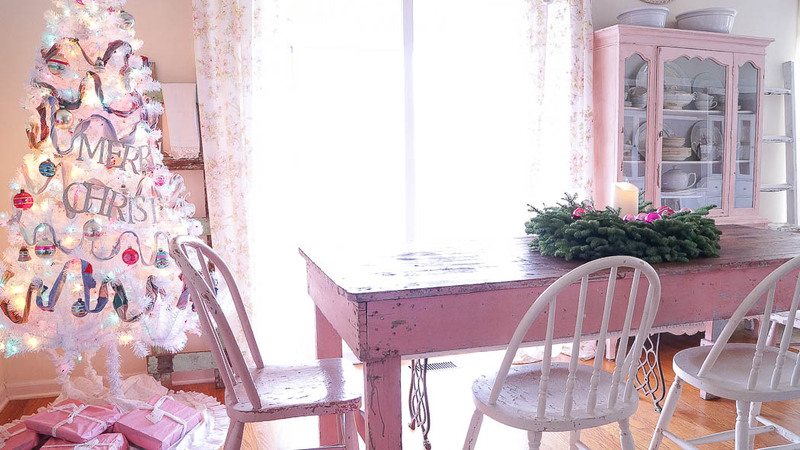 Your kitchen keeps getting prettier, Anne! 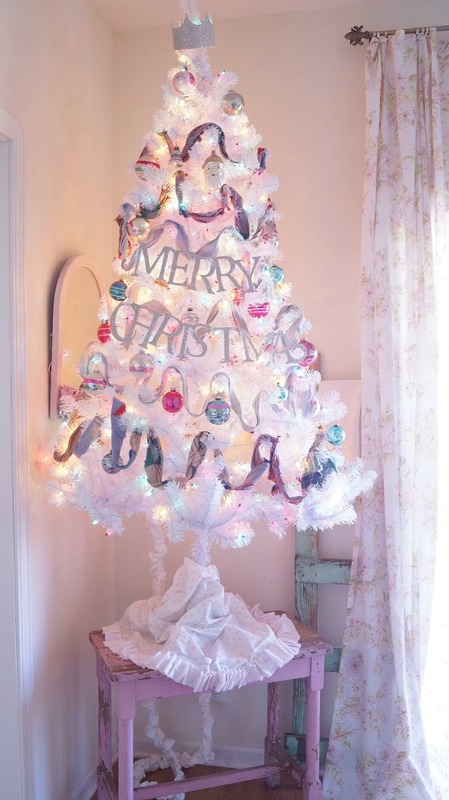 I love your whimsical tree! Thanks for joining the tour! I am a freelance writer and I like your kitchen. Do you have professional photos of the kitchen. I am. interested in submitting an idea to Cottages and Bungalows magazine. The photos have to br professional. What do you think? I love your pink hutch and table. Can you tell me the recipe for that pink colour? I sometimes find the pinks I’ve seen too dark a pink or too light but this is just perfect!